Of course it’s the people; Bryan & Charlie, Sammy, Phil, Ken, Ross, Jill, Tommy, Donna, Ray, Tom, Scott, Greg and others. Some of you left Heritage for other schools. Some of you are gone now. Still, when I return to Heritage in my mind, it’s you that I think about. Not that I do it much. Today is here, another is fast on its heals and achievement requires effort – the kind of effort that reveals “The High School Experience” for the pretense it was. We’re wiser now. Thirty years of life after Heritage has perhaps rendered us agreeable on one point. The qualities and traditions of high school, any high school, are a paltry rehearsal for what comes next. 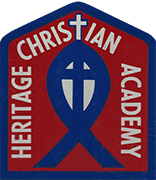 I hope you remember Heritage Christian Academy as part of a pleasurable past. If not, I hope you’re able to laugh at the remembrance of past troubles. To me, the only authentic heritage of Heritage is that we experienced it together. I appreciate the past. I’m satisfied with mine. Mostly I’m looking forward to the future. I hope the same is true for you!